Fletcher Magee&#39;s Shooting Remade Wofford. How Far Can They Go? At first glance, the Wofford Terriers seem like a very specific type of college basketball team. Even if you only watch college basketball in March, you know the one: the biggest fish in a mid-major pond, a styles-make-fights oddball match-up challenge for a major program, maybe even an underdog that enters the tournament at just the spot on the hype cycle where they paradoxically feel like a favorite against a better-known college hoops blueblood. Sometimes these teams win a game or two; most times they don’t. These teams are all different, but they play a similar role in the sprawling broader story of March. The Terriers will face Seton Hall in Jacksonville on Thursday night riding a 20-game winning streak; they have appeared in the last four AP Top 25 Polls of the regular season, and for what it’s worth have the edge in terms of seeding—the Terriers are a seven seed to Seton Hall’s 10. This year’s Tournament appearance marks the fifth in the history of the small liberal arts college in Spartanburg, South Carolina, with all five of those coming under head coach Mike Young, who is in his 17th season at the program’s helm and his 30th at the university. Lose the bit about the seeding and the Top 25 and, again, Wofford could be any other decently credentialed mid-major upstart. In their previous bids, they have been just that. Now, though, they’re shooting threes. So is everyone else, of course, but the Terriers are doing it better. They just wrapped up a Southern Conference Tournament championship last week ranked second in the nation in three-point shooting percentage at 41.6 percent; 40.1 percent of their points come from behind the arc, per KenPom.com, which is 17th-most in the nation. Wofford isn’t unusual in that it freely fires away from deep—this is 2019, after all. But Wofford, which plays in the conference that gave the world Steph Curry last decade, does as good a Golden State Warriors imitation as any team in college basketball. The Terriers would likely settle for a convincing imitation of Davidson’s 2008 team, a SoCon Cinderella that Curry shot into the Elite Eight, and which peaked just a few minutes away from the Final Four. A Charlotte Observer column dared to make that ambitious parallel just this week. In this analogy, Fletcher Magee is Wofford’s answer to Curry. “Steph has done way more great things than I have and was a better player,” Magee said during Wednesday’s press conference in Jacksonville. “It’s definitely high praise.” It’s also not unwarranted. Magee long ago passed Curry’s 414 made threes to set a new SoCon record. Magee now sits at 502, 45 ahead of J.J. Redick and just two shy of the NCAA’s all-time mark. He came to Wofford with a knack for moving off the ball to get open and a supremely quick release, whereas Curry controlled possessions at point guard. And while Magee remains an excellent off-the-ball player, he’s added the ability to effectively create his own shot. He stretches defenses in every way they can be stretched. But where Curry elevated the three-point production of a Davidson program already heavily reliant on the deep shot, Magee’s brilliance forced his coach’s hand. This Wofford team isn’t like the ones that came before, mostly because Magee isn’t like any player Wofford has ever had. Longtime Davidson coach Bob McKillop was early to the approach that an increased reliance on three-point shooting across the sport. In the five seasons before Curry’s 2006-07 arrival, Davidson twice ranked in the top 20 nationally for three-point scoring distribution, and never below No. 58. Curry elevated the program, as he tends to do. But he and his Davidson teams also set a tone in the SoCon still evident today, even after the Wildcats left for the Atlantic 10 in 2014. Wofford finished this regular season as one of four SoCon teams with a top 20 three-point scoring distribution, joining Furman, The Citadel, and VMI. 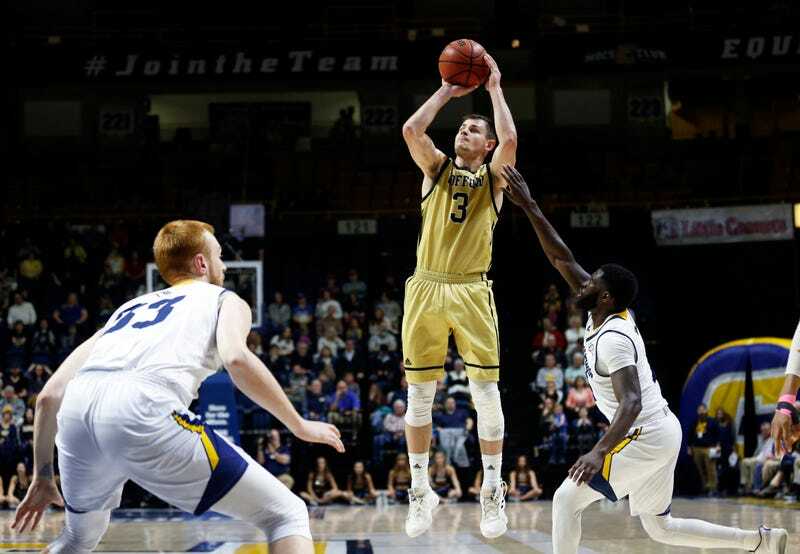 This has been the trend for the Terriers in Magee’s four years in Spartanburg, as his Wofford teams have never ranked lower than 58th and as high as seventh in three-point scoring. That trend is a strong deviation from the four Tournament teams that preceded Magee’s arrival, including the 2014-15 squad that made it to March the year before he arrived. That season, the 28-7 Terriers scored 28.6 percent of their points from behind the arc, 172nd in the nation. No Wofford team since 2007-08 had ranked in the nation’s top 100 in that category before Magee arrived, which accounts for every NCAA Tournament team of Young’s long tenure. So was Magee. “One of his first college baskets was a four-point play,” Kerns remembers. “It was expected that this kid was going to come in and contribute.” Magee finished that game against Missouri with 22 points on 11 shots; that first make was one of five successful triples on the evening. That it came against a Power Five-conference opponent foreshadows the role the three-point in general, and Magee specifically, will play in a possible Wofford run. “If you look at his track record against high-level Division I teams, he’s done pretty well. Shooting translates at any level,” says Mayberry, his high school coach. “You just have to be able to catch the ball and make that open shot when it’s available.” Just because it’s a truism doesn’t mean that it isn’t true—the three-point line is what Kerns called “the equalizer” for the Woffords of the field. Every team in the tournament that can make threes has a chance, even against the elite athletes that fill out the rosters at the top of each bracket. Magee has done more than just give Wofford a chance, though. He’s been integral to the program redefining its style and maximizing its potential. He’s changed everything, in short, and now he’ll have a shot to see how far into March he can lead the program that he helped remake. Kyle Kensing is a freelance sports journalist in Southern California.